Holiday rental in delightful Cabo Roig, sleeps 6 plus baby cot and chairs. Air-conditioning in all rooms, TV in lounge with UK TV, WiFi. Just 5 minutes walk to the nearest shops, restaurants and bars, 15 minutes walk to two beaches. 30 miles south of Alicante, 12 miles north of Murcia airport. Three golf courses within about 4 miles. Sleeps six in three bedrooms, baby's cot and high chairs, bathroom, shower room, sun terrace, shaded patio, lounge-dining room, kitchen, utility room, shared 18m swimming pool with children's area. Please see our web-site for special offers for early booking and longer stays. - locations of shops, restaurants, banks, etc. - operation of WiFi, TV, burglar alarm, etc. Pool-side loungers, chairs, tables for shaded patio and sun terrace, etc. Childrens toys and table top games. Frequent bus service to Torrevieja and Cartagena. We enjoy the villa two or three times each year. We particularly enjoy Christmas and New Year and the Three Kings Festival Procession in the evening of 5th. January - see below. It was ideally located in a delightful Cabo Roig, a sought after small town, close to beaches, restaurants and shops, with three bedrooms, close to the swimming pool. Ideally located close to beaches, restaurants and shops, with three bedrooms, close to the swimming pool. Also close to Torrevieja, another delightful town with supermarkets, many shops and restaurants, huge Friday market, fairground, boat trips, beaches, submarine museum, salt museum, etc. Christmas And New Year In Cabo Roig, Spain While the Spanish spend Christmas in quiet family get-togethers you can be sure that the British celebrate in style. Every town has a nativity display but the one in nearby Torrevieja, in the church square, is usually exceptional. In recent years the display tells the story from the visitation of the Angel Gabriel, the birth of Jesus, the three Kings, through to the flight of the Holy Family to Egypt to avoid Herod's massacre of babies. You could easily spend twenty minutes or more viewing the story. However the Three Kings Festival brings out the crowds to watch the 5th. January evening procession. The thee kings on their "chariots" decked out with finery are preceded by their soldiers, on foot and on horseback, and their harems. There are also farmers with lambs, piglets, geese, and donkeys. All are giving out sweets and goodies to the children. In Torrevieja the three kings arrive by boat at the harbour at about 5pm. and process to the church, taking about a hour to pass by. Afterwards you can enjoy dinner, be it Spanish, Continental or British, with a warming glass of Spanish Brandy, or whatever tipple you enjoy. The weather is generally good with about six hours of daily sunshine, temperatures reaching 17degC. ( 62degF. ) or more and low rainfall. Wherever you spend the celebrations, we wish you all a very Happy Christmas and New Year. Bathroom with bath, shower and toilet, shower room with toilet. Lounge-dining room with easy chairs for six and dining for six or more. UK TV channels, radio, DVD player. books, etc. Table extends to seat eight. Three pools each with a children's area. Outside: Shared pool, gardens and car parking in a secure complex. Utility Room: Washing machine and dishwasher, iron, ironing board. Cleaning / Towels / Linen / Maid service: Cleaning, linen and hand towels are included. Other: Sun terrace with barbecue, shaded patio. The villa is perfect for a family/friends vacation, comfortably sleeping 6. The pool is well-maintained and quiet, and a very short walk from the villa. 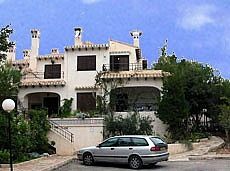 The location of the villa is excellent - close to the Bars/Restaurants and the Beach and Marina. Thank you so very much for your kind review. Very nice property with everything you need for a super holiday. the property was in easy reach of the beach and alll local amenities. We very much look forward to welcoming you again. Had brill time could lock veranda gate so felt safe toddlers playing out there . Just about 15 minutes walk from two lovely beaches. Murcia Airport just 12 miles, Alicante Airport 30 miles. Full joining instructions, with routes and maps, provided. Just five minutes walk to shops, restaurants, etc.